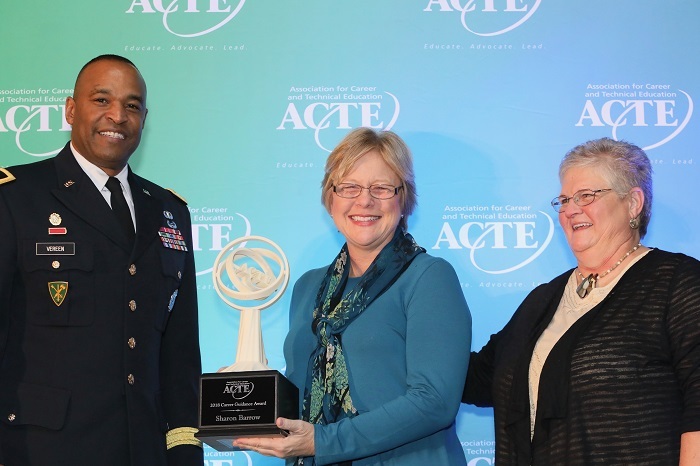 US Army Brigadier General Kevin Vereen (left) and ACTE President Gina Riggs (right) present ACTE Career Guidance Award to Sharon Barrow. With more than 23 years of experience in public education, Georgia Southern alumna Sharon Barrow (‘93, ‘95) has dedicated her career to the education and well-being of students. Her commitment recently earned her the 2018 National Association for Career and Technical Education (ACTE) Career Guidance Award. The award recognizes school counselors and career development professionals who have demonstrated efforts to connect students with opportunities for success, shown innovation in career exploration and development and have advocated for career and technical education as a viable option for all students. A graduate of Georgia Southern’s bachelor of elementary education program, Barrow’s first position in the classroom was a long-term substitute teacher position immediately following her student-teaching experience. Barrow returned to the University to complete a master’s in counselor education in 1995. Barrow has served as within the education system of Georgia, first as a teacher in Effingham County and a middle and high school counselor in Ware County. Today she is a high school counselor in Fayette County. “I am, at times, a sounding board, cheerleader, college and career resource and source of chocolate on really tough days,” she said. “My heart sometimes breaks for them when they struggle with various parts of growing and maturing, and I love it when students stop by just to share good news. My career as a school counselor makes me feel useful to others who have a need. During her tenure in the education field, Barrow has demonstrated success in many areas, creating innovative programs and events for students and earning more than $40,000 in grant allocations to fund the programs. She is also a former recipient of the Georgia Career Guidance Counselor of the Year by the Georgia ACTE. Barrow says winning the ACTE’s national award was a very humbling yet also exciting experience. She added that this recognition will also provide her the opportunity to bring attention to the counseling profession and the “vitally important” role it plays in public education. “My hope is that I can meet the opportunity with honesty, passion and positivity,” Barrow said. The National ACTE Career Guidance Award is sponsored by the U.S. Army and is awarded annually during the ACTE Awards Banquet. ACTE is the nation’s largest nonprofit association committed to the advancement of education that prepares youth and adults for successful careers. To learn more about the counselor education programs at Georgia Southern, visit coe.georgiasouthern.edu/coun/.